I usually pass up the jello molds I see at the thrift store, but when I saw this copper one, I just couldn’t resist. Granted, I didn’t actually know what I was going to do with it at the time I bought it, but sometimes I’m guilty of those types of purchases. I’ve tested out bundt pans to see if my umbrella pole would fit through them in the past, but the opening is just a bit too small in all the ones I’ve seen. But this jello mold has a large enough hole to fit the pole, with plenty of room to spare. After testing it out just to be sure, I put together my little succulent garden. 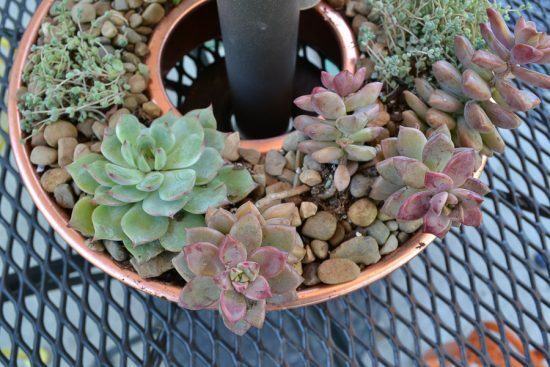 I’ve put together a complete post on how to plant succulents so they stay alive forever. Well, maybe not forever, but it covers how to plant them so they can thrive for a long time. I would definitely recommend taking a quick look. You’ll actually see some of the jello mold pictures used in the post! Of course, I’ll pull the planter in over the winter, probably at the same time that we put our patio table in the garage. 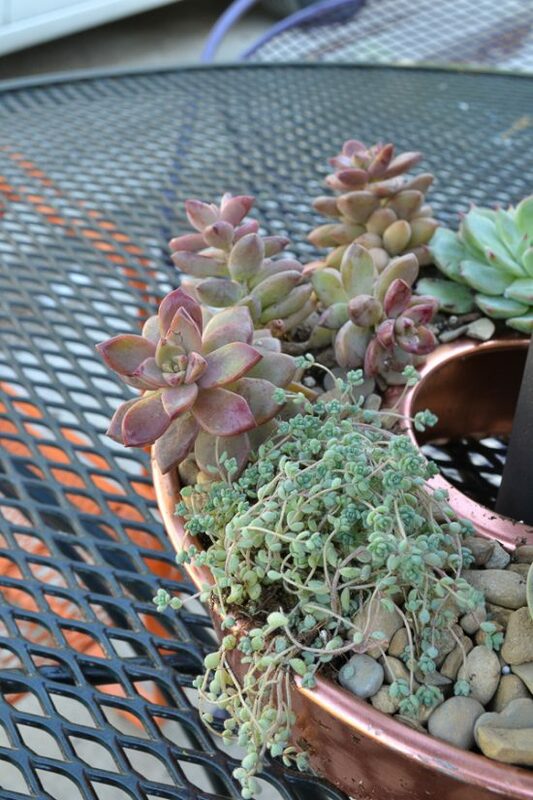 These little succulents wouldn’t stand a chance against Chicago winters! 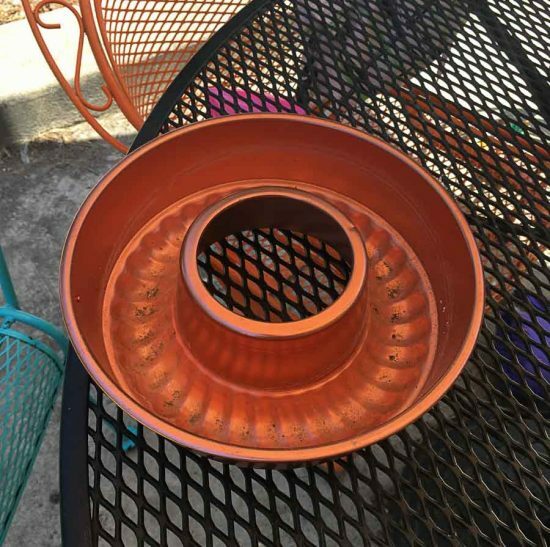 This planter couldn’t have been any easier to make, and for $1, it can’t be beat! What an awesome idea! I do not own a jello mold, but next time I am at the thrift store will look for one. Too pretty of a project to skip:) Pinned! Thanks so much, Milena! It was such a fun and easy project. Great use of a jello mold! 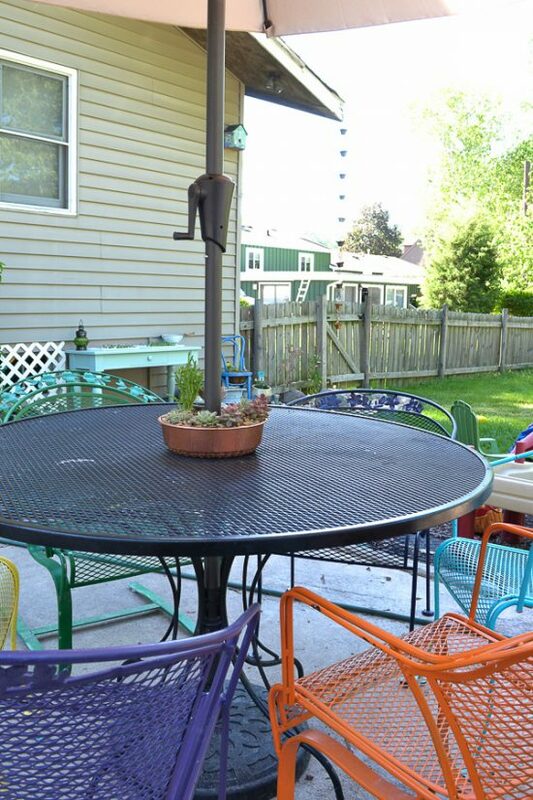 Love the look of plants around the umbrella “hole” of a table. Visiting from Makers Party. Genius! 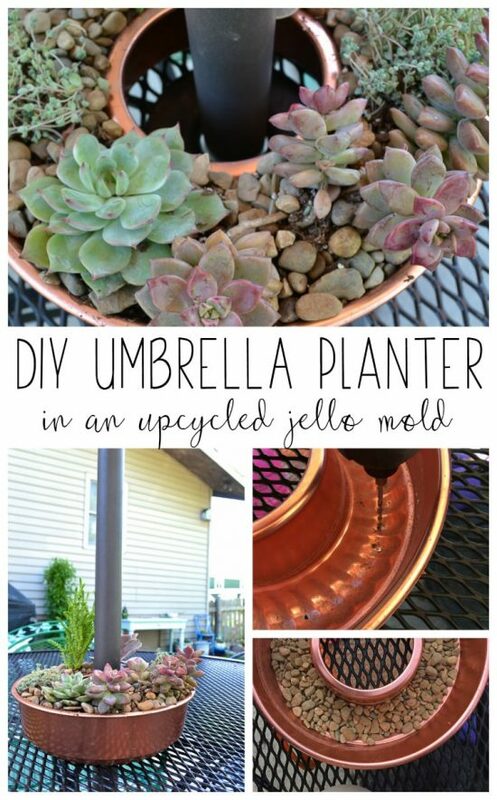 Using the jello mold as a planter for your outdoor umbrella table is such a smart idea! 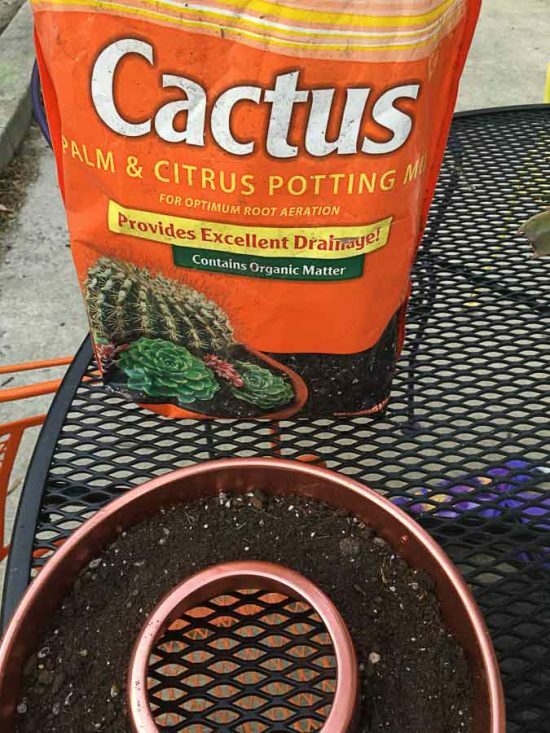 Thanks for the tip about the cactus soil. You betcha! Thanks for stopping by! This is such a darling idea. I love how it spruces up the table. I’ll be looking for a jello mold at the thrift store. Thank you for sharing on Over the Moon link party. Pinned and shared. Thanks, Amy. Good luck in your search for one! Thanks, Jodie. Me too – the perfect combo! I loooove this idea Jenny! The mold is perfect for the umbrella and looks so cute with the plants. What a great idea. Thanks so much for linking it up to the Inspiration Galore Project Party this week. You are one of my Features tomorrow over at Recreated Designs. Happy weekend! Thanks so much for the feature, Lisa! This is SO cute Jenny! I have some old bundt pans that I can’t use to bake with anymore and that’s exactly what I’ll do with it! Thanks for sharing at our party! Featuring you tonight! Thanks, Kendra! You totally should use them up as a planter. Thanks so much for the feature!! Wowe what a great idea. Now to go buy that jello mold and get started. 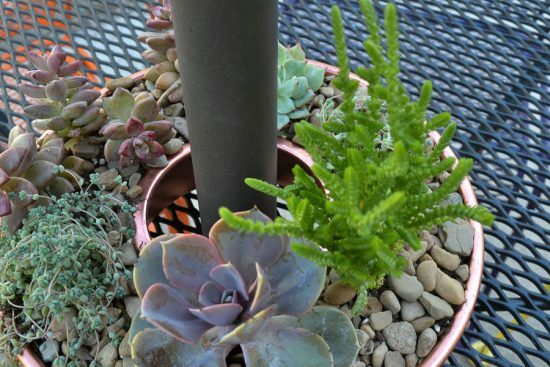 love this, especially around the umbrella and with succulents!